There are hundred of companies that are now develop BJJ apparel including BJJ Gi’s and Belts. Before belts were a simple construction of fabric folded over a core and sewn together but these days belts can be made from gi material and even hemp. The main difference between BJJ belts and normal martial arts belts, is the black bar. This is used to add tabs to the belt to signify a belt level’s progression. We take a look at some of our favourite Jiu-Jitsu belts available on the market today. As well as making stellar BJJ Kimonos, Fuji also develop some fantastic belts for jiu-jitsu. Coming in the 5 traditional rank colours, as well as any extra colours that your school may decide to use. Fuji Belts are made with a high standard and use some of the best materials available to make sure their belts can withstand intense gripping and grappling sessions. This belt is quite pricey for a Jiu-Jitsu belt but this should be the only belt to last you until your next grade. This is a great belt for any practitioner and are fully IBJJF legal. If you’re looking for a fantastic all around belt, well this might be the best bjj belt on this list. Venum Jiu-Jitsu have made quality martial arts goods for a number of years and these belts are up there. Venum’s bjj belts are made with 100% high-quality cotton that is quite thick, so they take a while to soften up. One these belts soften up, there are probably one of the best thick belts on the market. As well as being great quality, they are also a reasonable price and will last you a very long time. This belt also comes with a free Venum gi patch as an extra free gift. Sanabul have built a reputation in the sport as being some of the best well-priced and well-made bjj products on the market. The IBJJF approved Sanabul BJJ belts are great for competition as well as every day training. The sleeve is a good length on the belt and is attached firmly. This belt comes in all standard sizes and rank colours and doesn’t shrink in the wash. Sanabul also offer kids sizes as well as kids grade. Because of their great price and high-quality you will be confident that these belts will stand the test of time. Now the Hypnotik is a special belt on the list. This is the only belt that is actually made with actual gi material. The Hypnotik uses a pearl weave, just like made standard gis to make a flexible yet strong jiu-jitsu belt. These belts will not only last you a long time but they are perfect hand-me-downs for other members in the gym. As well as being super high quality these belts are also priced extremely well. So if you’re looking for a belt that looks great at competitions, training or seminars this is the be belt for you. As one of the most popular BJJ belt, Habusa are actually one of the most reasonable, but don’t mistake excellent prices for cheap quality. Hayabusa have been making quality jiu-jitsu products since 2009 and this shows. Hayabusa belts are 4cm wide and 0.5cm thick and are available in all rank colours. There is a lot of mystery linked to the beginnings of the Brazilian Jiu-Jitsu belt system. The oldest story with any martial arts belt is that students would start practicing as a white belt and then over time their white belt would dirty and eventually become black. This is also where the myth of not washing your belt comes from, however this has been scientifically proved as unsanitary. The black belt in any martial arts is meant to represent mastery, hard work and dedication to the art. However, the truth is, the founder of Judo, Jigoro Kano, introduced the original black belt system in 1882 at the original Kodokan martial arts school. Kano apparently got the idea from Japanese high school swimmers, who wore black ribbons around their waists to signify their advanced status. At the Kodokan, white belt students were deemed as beginners, and black belts were awarded to students who had mastered the fundamental Judo techniques. This was still two belts however and intermediate colours were introduced throughout the life of the martial art. After meeting with Kano’s student Maeda, in 1952, grandmasters Heilo and Carlos Gracie brought in the belt system for Gracie Jiu-Jitsu. This was based on instructorship, rather than actual martial arts skill. Even accomplished students at the academies wore white belts, due to the fact they did not take the instructors course. Students who did decide to proceed to becoming instructors were given light blue belts and after they became a professor, they earned a dark blue belt. Black belts did not exist in this period of Brazilian Jiu-Jitsu. In 1967 black belts were first introduced into Brazilian Jiu-Jitsu along with the grading bar system that separated themselves from other martial arts. 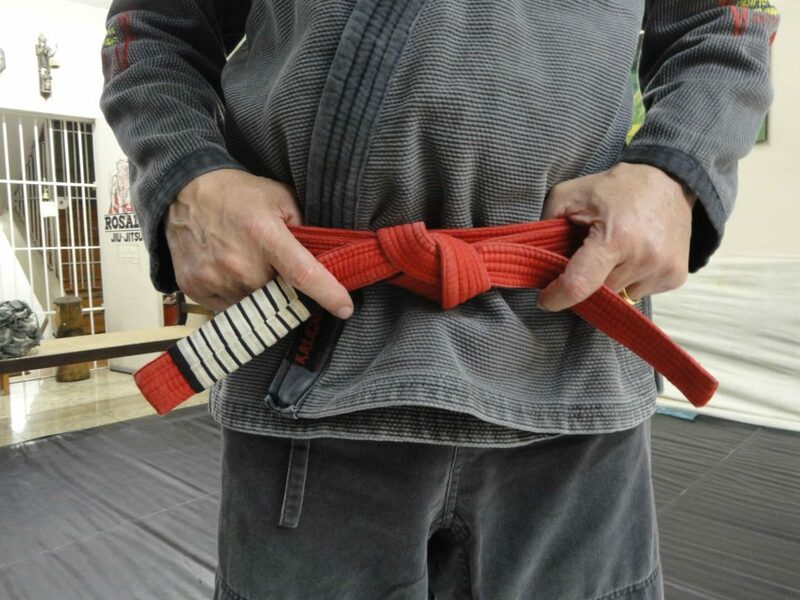 There are two black belts available for Jiu-Jitsu fighters, the first is the traditional black belt with the red bar, this signifies that the black belt is a teacher and will often instruct classes, there is also a variation on this where a red bar is adjoined with red and white stripes at the ends, this signifies the professor and the head instructor of the gym. 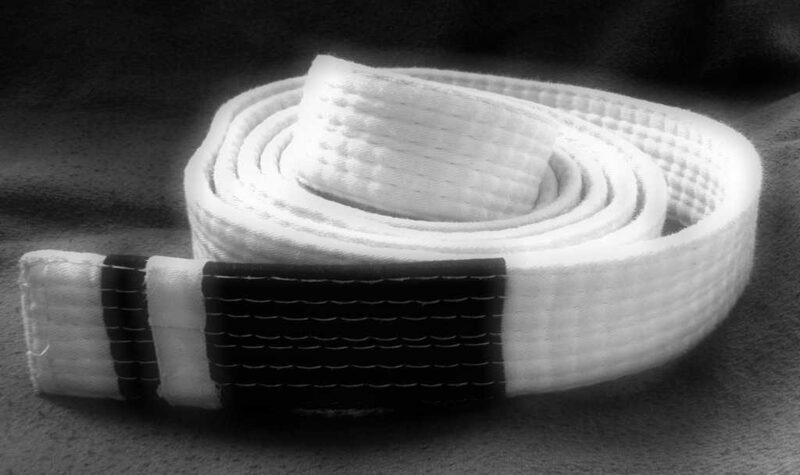 The second black belt is a belt with a white bar, while this is more commonly seen in competition, this signifies that the black belt does not teach but is a competitor. 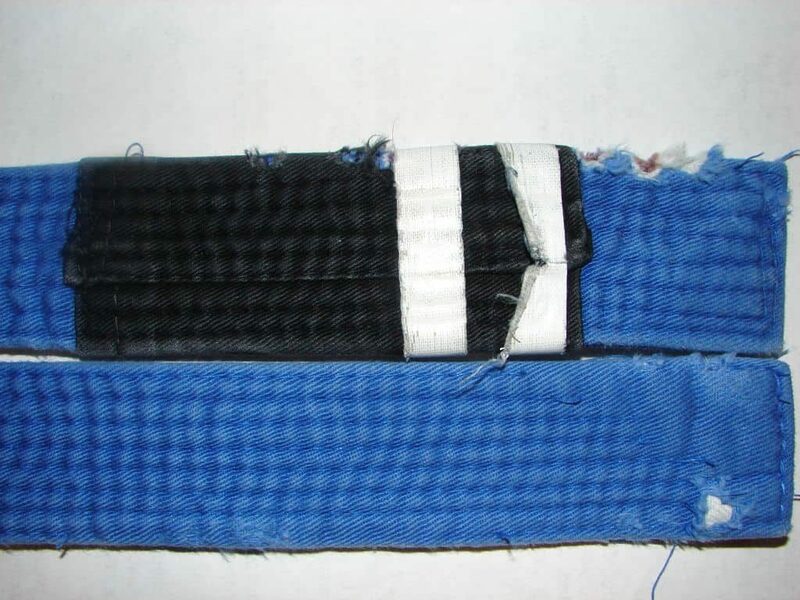 The modern Jiu-Jitsu belt system goes from White, Blue, Purple, Brown, Black. There are also coral belts and black belts for after your black belt but people are less focused on these as they require years of dedication, sometimes more than is what is available in a lifetime. When you first start a martial art you wonder how people have their belts so nicely arranged in a nice bow when your’s is a complete birds nest. Tying your belt is probably one of the first things you should learn in BJJ, just so you don’t look like a complete amateur. 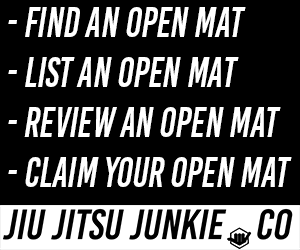 There are several ways you can tie a jiu-jitsu belt surprisingly and this video below can help you with that. Below we go into detail on what you can expect and what you could and should focus on at each belt level, this has been collated through a number articles and books and extrapolated to help students and instructors look at what is needed at each belt level. Keep in mind that these are just guidelines and shouldn’t be taken as the word of Helio, but no matter what, remember to simple enjoy your training, try not to focus too much on your next belt level or competitions, as Rickson would say “Flow with the go”. As a white belt, you are a beginner and you should always keep that in mind. Your goal is to be a sponge and create a frame of reference for future learning. Imagine jiu-jitsu as a giant jigsaw and you’ve just tipped it out onto the table and have no idea where to start. You start with the frame of the jigsaw collecting the relevant pieces, understanding that these individual pieces with form the boarder of the eventual picture. The same is with jiu-jitsu at the start you’ve been shown a number of techniques that you have no idea what to do with and over time you’re shown other techniques that you can look to start building a framework with. Studying flow diagrams and finding basic fundamental curriculum papers can help you focus in on what needs to be a priority. Learning to breathe and relax is a fundamental skill in jiu-jitsu and the sooner you learn this the better. I can’t remember how many times I’ve rolled with white belts only to have then grip onto my lapels for dear life because they don’t know what to do. A good way to learn to relax is to learn to let go of your ego, if you’re happy to understand that you will be submitted a lot and are willing to learn from it then you will A) eventually relax into sparring, B) learn more form the roll. Remember, nothing is expected of you at this stage, you won’t win every sparring encounter, so instead of winning try to learn. YouTube can be a white belts enemy, often in a flurry of enthusiasm, a white belt will want to learn all the techniques under the sun. It is much better for you to get a deeper understanding of a small number of techniques than focusing on how to get from rubber guard into crack head control. Conditioning is good for any BJJ fighter, so the more you focus on that at the beginning the more you will benefit from at later belt levels. Look at fundamental positions in jiu-jitsu and learn their names, learn the difference between mount and closed guard and a triangle from an armbar. Let go of your ego, that will allow you to learn more from rolls and help you relax when you’re sparring. Prepare for a long road ahead, if you have the bug then you know that it will be a long road ahead, learn to feel how jiu-jitsu works and understand the mechanics of it. Knowing that should give you a good idea of where you need to go from at blue belt, the later stages of being a white belt and beginnings of a blue belt should be a place to solely focus on your submission defense. Often an instructor will need to see a really solid base level of defense before any consideration of a purple belt. As a blue belt, you should be fairly familiar with the concept of movement and balance in jiu-jitsu. Going back to defense you should also look at improving your position awareness, knowing where each individual limb in, in order not to get caught out by a sweep or a submission. Towards the latter stages of the blue belt, once a solid defense has been built, it’s now time to start on sharpening your weapons. Before looking for a submission you should look at passing guard and be obtaining position. Passing the guard is considered by many, one of the toughest aspects of BJJ and at every belt level that idea of passing the guard before more complicated when more advanced techniques are thrown into the mix. You will spend a lot of time in an opponent’s guard, so knowing how to break grips, maintain and look to pass is a fundamental that all blue belts should know. A blue belt should know how to pass fundamental guards and know how to maintain posture in more advanced guards. Have two solid escapes from all main positions: Mount, Back Mount & Side Control. Fight in at least one competition, just so you can judge your skill levels with others at your belt level in other gyms. At purple belt, you should now feel like you are able to put parts of the jigsaw together, through your years of training you should now be developing a sense of timing and sensitivity. Here you should be able to make lower level belts fall into traps you set and generate momentum to change the course of a fight. A wasted movement will become less and less and you should now be able to roll quite lazily with lower belts without much worry of them dominating you. Even though sparring is a huge part of BJJ, at purple belt you really need to clock up some hours. Spend you time rolling with various grades, if you’re rolling with lower belts, look to improve holes in your game, practice those fundamental movements and get them feeling crisp. As a white and blue belt, you tend to spar mainly with your A game. Now as a purple belt it’s time to go back and revisit moves that you may not have a lot of knowledge and skill in. If you’re unsure of this ask your coach and set out on a focused plan on how to turn those weaknesses into strengths. You need to be a well-rounded fighter by the time you hit brown. 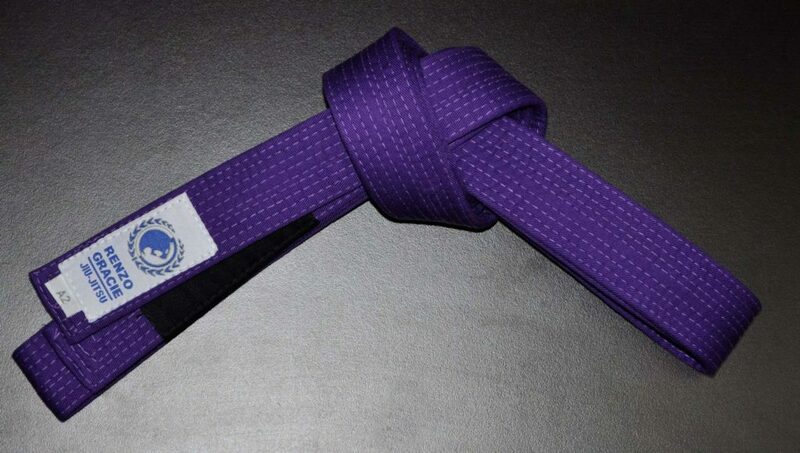 A competent purple belt should be able to attack from any position. As well as knowing fundamental guard positions, they should be developing and experimenting with various forms of open guard. A practitioner should start learning to attack using a combination of techniques – an initial submission attempt and then a counter to a standard defense. 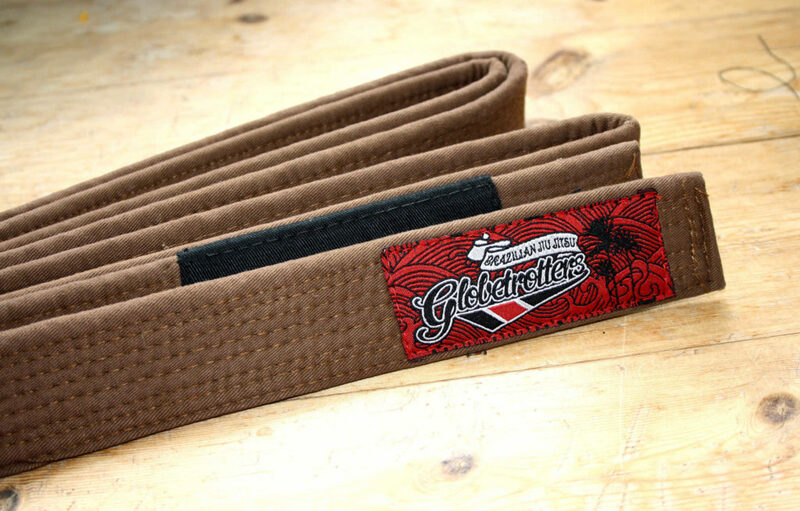 The brown belt is a point in your jiu-jitsu life where you should make that transition from defense to all out attack. With a Roger Gracie air-tight defense you laid the groundwork of your earlier days of training you should now have a solid base to which you can develop your attacks. A brown belt should be a threat from every position, especially the top. As a BJJ brown belt, you should understand your own body weight and should be able to surf a body below you. This will allow you to react to any defensive attempts from the bottom. Even though you should have fleshed out a style for your jiu-jitsu, it is worth knowing the game from a very deep and technical position. Roger Gracie may not use Berimbolo’s to take the back but you damn well knows how to defend it. Having a technical depth of knowledge also means you can develop your chess game, you should start to think at least two steps ahead of your opponents, maybe more, depending on their belt level. As a purple belt you may have found yourself teach a class every now and again, but as a brown belt, you should be looking at teaching regularly, at least once a week. Becoming a teach will allow you to look at your own technique objectively and help you fill in any holes in your game in order to help your students improve theirs. As a black belt, you’re always learning and you now know that there are no absolutes in jiu-jitsu. You can now look to take those fundamental techniques that you learned and ingrain them into your psyche. Techniques should be transcended and you should be able to easily flow without any problems. Your deep, intuitive understanding of jiu-jitsu means that you should be able to feel your way through most matches, even when confronted with a technique you’re unaware of. A new black belt is like a white belt in the black belt world and so you should look at everything with a fresh pair of eyes. You though the pool was deep before? Think again. You are now able to take fundamental techniques and see tiny nuances that you can add to help improve it any make it better. You may have practiced this move a thousand times but a thousand and one maybe the one. The path to black belt is built in strength and humility as a black belt you have been the hammer and the nail constantly so you know the highs and lows of competitive life. By this stage you will know your body better than most people knows their, your mind and spirit has completely morphed from what it once was at white belt to what it is now. You have an acute understanding of your ability and limitations. A black belt should be humble, friendly and respectful of others. Although you are highly efficient in a dangerous martial art, you never look to seek confrontation and look to resolve any conflict through the power of words and self-confidence, not through choking someone out. Look into yoga, in order to keep your body supple and flexible. As a black belt your body has been through some wars, so it’s time to stop the process of aging. Don’t worry about it. Very few people will reach this level.